Ok – maybe not horrible; just not marketing-ready. A house you’re not in a hurry to photograph because you know it’ll look less than beautiful. At best. Problem is, taking on a poorly presented home makes you look bad. Partly because it’ll make the listing look terrible, but also because it’ll probably take longer to sell, unless it’s specifically and realistically priced. But given that you only took it on in the first place because you were a tad desperate for stock, perhaps you valued it a tad high too…? So how do you tell a vendor that they need to improve their presentation to sell more effectively? The gentleman of the house glared at me, and placed a protective arm around his wife, who had burst into floods of tears. The meeting didn’t last long from that moment…. Over the years, I learned what to say – and importantly – what to keep to myself, so I didn’t upset or annoy anyone. So after dealing with around 1000 vendors over the last 12 years, I’ve compiled a list of DOs and DON’Ts to help you avoid the same mistakes I have, and dodge any unwelcome floods of tears. DO be sensitive: even if their kitchen wasn’t built from the dance-floor where they did their courting, it could have been fitted by someone’s late relative. Every area of their home is a potential minefield, so tread very carefully. Ask questions to uncover any sensitivities before you start making suggestions. DO go for the small wins first. I was in a home in Gloucestershire some years ago, in a living room that was giving me a headache. The carpet was flowery green. So was the wallpaper; and so was the sofa. But none of it matched. The greens were slightly different, and the patterns clashed; loudly and painfully. “How long have you had your sofa?” I asked, carefully. “Oh years! It’s hideous, isn’t it?” came the reply. I looked at the owner, hopefully. Next came a little dance of diplomacy, where I persuaded them that changing their old worn-out sofa for a nice new cream leather one now rather than waiting, would make the living room so much nicer, and wow their buyers. So they did. Then they decided the wallpaper looked wrong, so they changed that…. Still kept the carpet, but two out of three isn’t bad. DON’T advise them if you don’t know what you’re talking about. After all, you’re an estate agent, not a home stager. If the scope of work needed is beyond you, or you’re having sleepless nights over whether to tell your client to paint their dining room Vanilla White or Magnolia Cream, it’s time to call in the professionals. Home stagers are available in most areas now, and cost as little as £30-40 an hour for their advice. If you don’t have the margin to cover the cost yourself, offer to deduct it from the completion monies. Or just make the intro, if you’re confident of their abilities, and leave them to sort your client’s house for them. They’ll do a far better job than you will (we hope) and they are used to telling people their taste is awful, (or words to that effect). DO remind your client frequently that it’s not you who doesn’t like their shag-pile carpet in their bathroom; it’s buyers – they are so fussy these days, and we must bow to their will, so they will buy this house. Make a list of all the attributes buyers these days insist upon (unless they are really looking for a project): hard floors in bathrooms, kitchens less than a decade old, simply dressed windows, plain carpets, etc. I’m sure you have plenty of your own you can add to the list. Then take your checklist along to the market appraisal and go through it together. That way, it forms a basis for discussion, and looks more credible (and less personal) than critiquing their Anaglypta and dado rails. 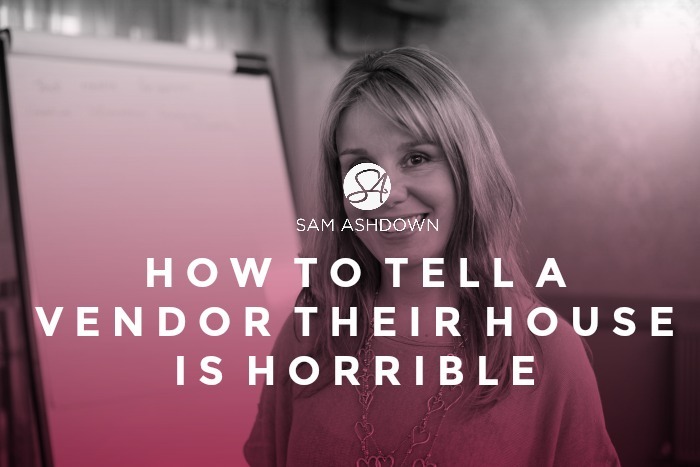 DON’T gift another estate agent with the benefit of your presentation advice. You really need to ensure these guys are your vendors, before you give away your time, effort and expertise. Seeing a newly painted living room and carpeted hallway will be painful, if you’re looking at one of your competitors’ Rightmove ads.